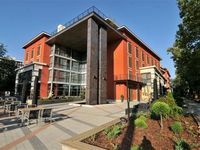 By the opening of the five-star Hotel Divinus, Debrecen's hotel network has been crowned finally. 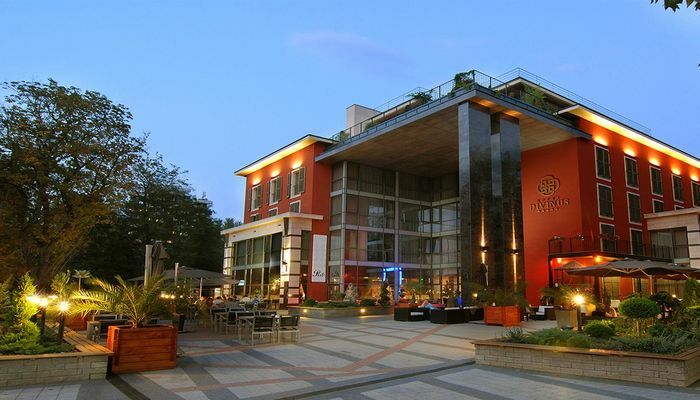 The decent hotel wearing Mediterranean colours, which can be found in walking distance from the city centre, represents a new quality and approach in the hotel industry. Its unique location provides the advantages and comfort of both a downtown and a greenbelt hotel at the same time. With its 150 rooms and 29 appartments with green terrace exhibiting classic furniture in recent outfit, and its mechanical equipment satisfying 21st century requirements, the hotel is a worthy representative of the city, which is growing the most dynamically in Hungary. Whether coming for business or leisure, discreet style and great choice of service will be the guarantee on the unforgettable experience. There are 150 classic rooms, 19 delux rooms,which are convenient to receive guests, with their separated living and bedrooms, there are 6 suites having two bedrooms and a living room; and the 4 luxurious suites with their comfort assured by 120 m2 - floor space and their meeting room convenient for business appointments - complete the wellness and conference services in an integrated way. The hotel has a restaurant for 300 people, a bar with long opening hours and a mediterranean grill terrace which is open from spring till autumn. The word 'wellness' is as blending of the expressions 'well being' and 'fitness'. It is a lifestyle and a practical philisiphy at the same time, its principle is: health is more than the absence of illness. Selfness is a learning process aiming self-cognition, by which one can learn how to make decisions resulting bette qualities of life. Part of services: 25 ms long swimming pool - relaxation pool, Jacuzzi - paddling pool, Hip . pool, Infra sauna - Finnish sauna, Steam cabin - massage rooms, Solarium - wellness bar. Beauty care services: Hairdressing salon, Beauty parlour, Manicure, Pedicure. Hotel Divinus***** awaits business travellers with the latest technical equipment and a skilled staff. The capacity of the conference halls provides convenient places for organizing smaller meetings and greater seminars, even conferences for 200 persons. A 200 m² large space for exhibitions and the business centre - which is open around the clock - make the liberty provided by the hotel's audio- and video conference equipment full. The basic technical equipment of the house includes: slide- and overhead projector, flipchart, mobile and set-in screens, mobile and set-in amplifier, LCD Tvs and screens, internet (wireless, too), conference microphone, sound recording, technical assistance. • El precio de la pensión completa es de 9000 HUF por persona. • Garaje de pago para los clientes. Precio por vehículo y día: 3000 HUF. • Alojamiento gratuito para niños menores de 5,99 años en la habitación de los padres. • En caso de cancelación después de la fecha límite o en caso de no presentarse, el hotel cobrará una penalización por el importe del 100% del alojamiento.